Join us at the Irish Literary Society Annual Dinner on 1 June. 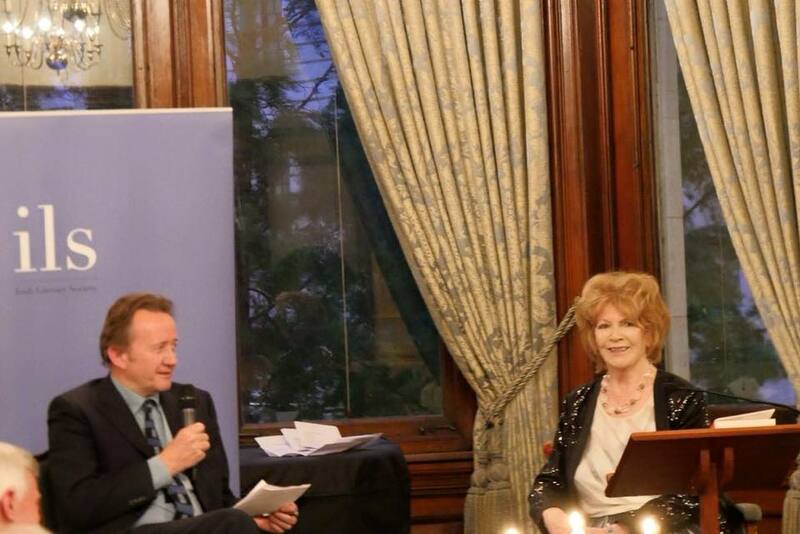 The brilliant Edna O’Brien, our Guest of Honour, will be reading from her work and taking questions from our Vice President, Prof. Roy Foster. The ILS kicked-off the Yeats 2015 celebrations for the 150th anniversary of the birth of one of Ireland’s great poets, William Butler Yeats, at the Annual ILS / Irish Embassy Yeats lecture in September 2014. In addition to Edna O’Brien’s appearance we are delighted to announce that the 2014-15 season will be closed with a little Yeats tribute at the Annual Dinner. A three-course meal is served in the Liberal Club’s David Lloyd George Room. A cash bar will be open prior to the dinner. Dress-up, come along and have a great evening with us. Dress code: lounge suit with tie. I wish to apply for the following tickets for the ILS Annual dinner. __________tickets @ £43 for members and __________tickets @ £49 for non-members. I enclose a cheque for £_____ payable to ‘IRISH LITERARY SOCIETY’.